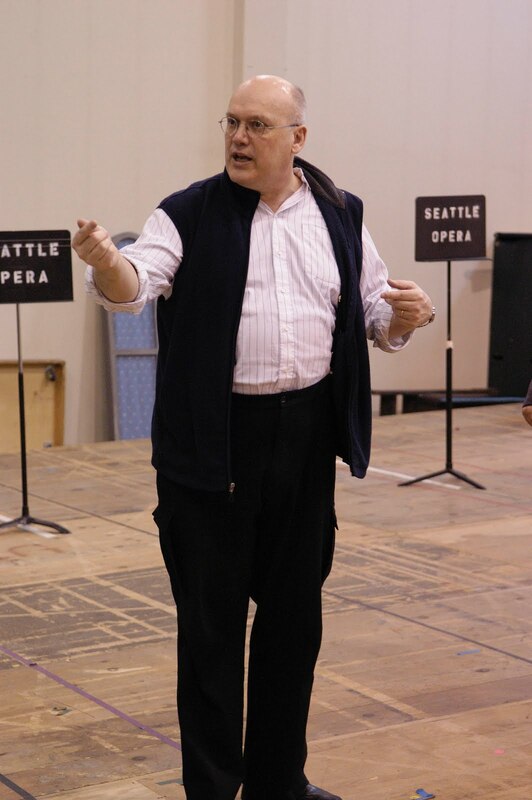 Today we're checking in with Jonathan Dean, who's out in Cincinnati fine-tuning the supertitles he wrote for Cincinnati Opera's production of Die Meistersinger von Nürnberg. I'm glad I came all the way to Cincinnati for this two-day final dress of Die Meistersinger von Nürnberg, not because I had to rewrite so many titles, but because it's such a great pleasure to hear this astonishing opera. Cincinnati's cast included lots of singers who've also graced our stage in Seattle, including Twyla Robinson as Eva (Countess in Marriage of Figaro, 2009), Maria Zifchak as Magdalena (Dorabella in Così fan tutte, 2006), John Horton Murray as Walther (Bacchus in Ariadne auf Naxos, 2004), Morris Robinson as the Night Watchman (Bonze in Madama Butterfly, 2001), and John Del Carlo as Kothner (a role he sang when we did Meistersinger in 1989; more recently he did our Bartolo in The Barber of Seville in 2000). They also have several fine singers who've done the opera many times in Germany, and the marvelous Cincinnati Symphony, with 70-some members of the Cincinnati Opera Chorus, augmented, in the final scene, by the more than 100 singers of the Cincinnati May Festival Chorus. (Did I mention that Meistersinger is humongous?) John Keenan, a fine young American conductor, leads what, to judge by the love you can hear in the sound, must be his favorite score. Putting on this vast opera is an enormous undertaking, and Cincinnati Opera has met—and overcome—an incredible array of challenges in the process, some of which are detailed HERE. Kudos to Cincinnati Opera's resourceful staff, and to the brilliant Chris Alexander (at right, during a staging rehearsal for Seattle Opera's Contes d'Hoffmann), who directed—as Keenan conducted—out of a deep and abiding love for this great work. 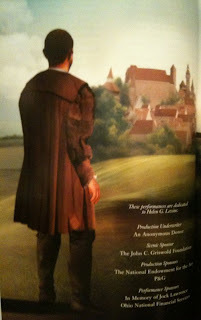 (Chris grew up hearing this opera, because his father played Beckmesser many times.) Although the economic slump interfered with the original plan—to set the opera in 19th century Cincinnati, so that the final scene, the song-competition, would be taking place right there, in the historic Cincinnati Music Hall, where Cincinnati Opera performs, implicating the audience in the action—Alexander still managed to break down that fourth wall for the conclusion. Meistersinger ends with this huge festival/party scene, something along the lines of Seafair meets Pride meets American Idol. As the scene gets going, Alexander has streams of costumed Nürnbergers coming through the audience, handing out flowers and flags and glad-handing the crowd; trumpets, acrobats, little kids, and a whole ballet company onstage; and then, for the great moment of the "Wach' auf" chorus, the Cincinnati May Festival Chorus rise up from where they've been sitting, in the balcony, to shower everyone with glorious song. He has also managed to make every minute of this 6-hour long feast of song DRAMATICALLY compelling, no easy feat. I have to commend him for finding ways, in each scene, to involve the many, many characters who aren't singing, at any given time, as listeners and reactors. That's one of the great challenges in staging Wagner, and Chris Alexander has accomplished it magnificently. This weekend has been my first experience with Cincinnati Opera, which is an extremely different kind of company from Seattle Opera. (And that's not just because it's swelteringly hot and humid here, whereas I hear it's still November in Seattle.) Cincinnati is a summer opera festival, only June and July, with (usually) four operas performed twice each. Next to the Met, it's the oldest company in America, dating back to 1920; though for the first fifty-some years they performed in a pavilion in the Cincinnati Zoo! (It's reputed to be one of the nation's finest zoos, I'm heading there today.) From the beginning, the company has been closely connected with the legendary University of Cincinnati College-Conservatory of Music, the school that has given our Seattle Opera Young Artists Program more promising young singers than any other institution. Music, and music education, is and has always been very important in Ohio (Cleveland is another great city for music). Evans Mirageas, the Artistic Director of Cincinnati Opera, is presenting Meistersinger partly because the audience asked him to "Bring back German opera!" (Although they've never done a complete Ring, Cincinnati Opera has done hundreds of performances of Wagner's operas.) Mirageas is also interested in presenting contemporary opera: in recent years he has given Golijov's Ainadamar and Catán's Florencia en el Amazonas. The company also co-commissioned Margaret Garner, with music by Richard Danielpour and libretto by Toni Morrison. Who knows what other new operas may come to Cincinnati in the next few years...? Hallo, Jon & Other Readers!! This sounds like a really great production!! Glad you, Jon, are able to experience it AND that the audiences will get to benifit from your excellent titling -- VERY important in this magnificent comedy!! !